Life is a cyclical journey through our issues and processes, and this is why things that are technically new often seem very familiar. Whenever we work to release a habit, change a pattern, or overcome a fear, we often encounter that issue one last time, even after we thought we had conquered it. When this happens, we feel defeated or frustrated that after all our hard work it has come around again to confront us. However, the reappearance of a pattern, habit, or fear, is often a sign that we have come full circle, and that if we can maintain our resolve through one last test, we will achieve a new level of mastery in our lives. When we come full circle, there is often the feeling that we have arrived in a familiar place, but now we ourselves are somehow different. We know that we can handle challenges that seemed insurmountable when we began our journey, and there is the feeling that we might be ready to take on some new aspect of the old problem. We feel empowered and courageous to have taken on the challenge of stopping a pattern, releasing a habit, or overcoming a fear, and to have succeeded. At times like these, we deserve a moment of rest and self-congratulation before we move on to the next challenge. 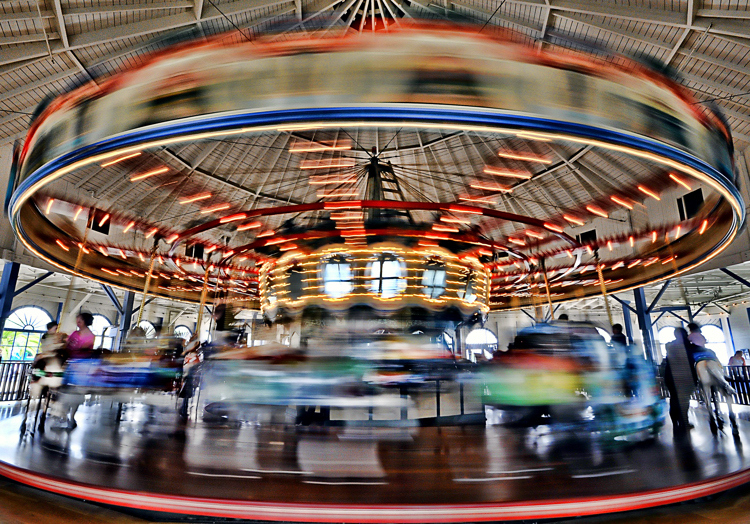 We found this gorgeous antique carousel after exploring underneath the pier at Santa Monica, California. It was just being loaded with excited children and parents as we stepped in to have a look. Quickly realizing the potential for some Motion Blur Photography, we set up our cameras for low shutter speeds and found solid perches against the handrail. 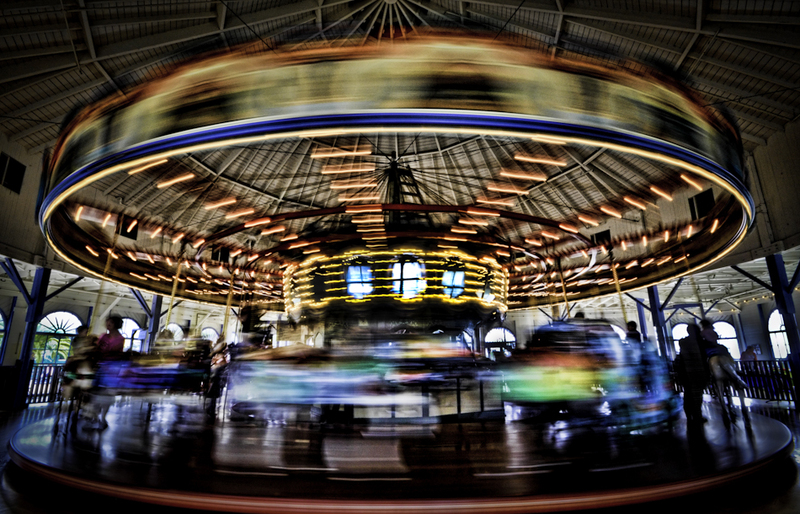 As the carousel began to spin, we experimented with varying the time that the shutter was open until we achieved the desired effect. As soon as we were done, an attendant approached and informed us that photography was prohibited here unless we had a license from City Hall which we could apply for Monday through Thursday. There are many places where photographers are not welcome to use tripods, but this was the first time where just resting the camera on a handrail seemed to be of offense. 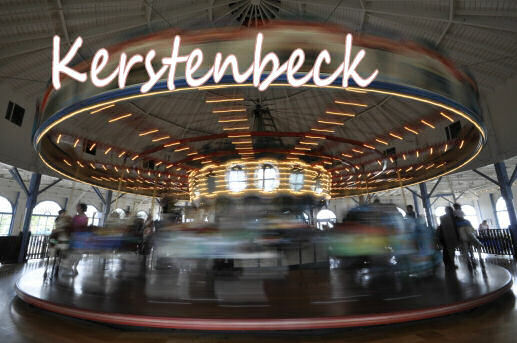 Built by the Philadelphia Toboggan Company in 1922, this carousel from the old Ocean Park Pier replaced Looff’s original merry-go-round in 1939. I found this red Life Gaurd rescue boat under the pier in Santa Monica. 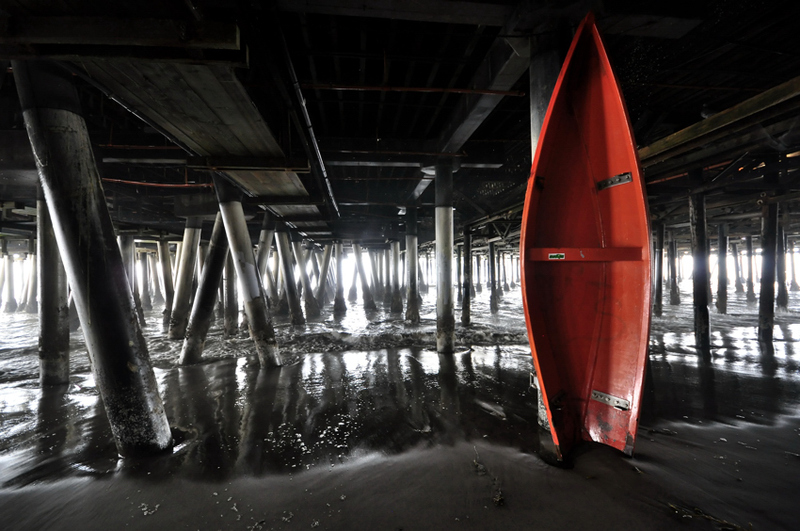 I spend a lot of time under piers, love the leading lines, structure, decay, barnacles…. always some jewels to be found. Note that this shot is NOT a BW Conversion with masking to get the boat to pop. came over to shut us down. We had no clue it was against City Ordinance to take the photos at the Carousel- (maybe due to the kids on the ride?) Anyway, the good part was they did not make us delete them before they let us go on our way.